The GDS 2010 has been designed with features that will provide an effective response to the detection and control of gas hazards in a wide range of industrial enviroments from boiler plant rooms to offshore petrochemical installations. 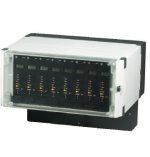 The system is offered in a wide range of enclosures, from single module din rail mounting to multi-channel interconnected 19" rack based tower systems of unlimited size. Each alarm module operates independently having alarm status indicators, sounder and three alarm levels with individual relays for the control of remote safety systems. 4-20mA or 0-10V outputs are available for use in proportional control systems such as speed control of extractor fans. Common alarm relays and indicators are available via an optional facilities module which can be plugged into any available module socket on the system. The facilities module can also be used remotely as a control and status indicator panel, having built-in sounder with sounder accept and alarm reset functions. The advanced features designed into the GDS2010 system ensure ease of maintenance and provide the highest integrity rating, with the minimum loss of sensor cover should a fault condition occur.